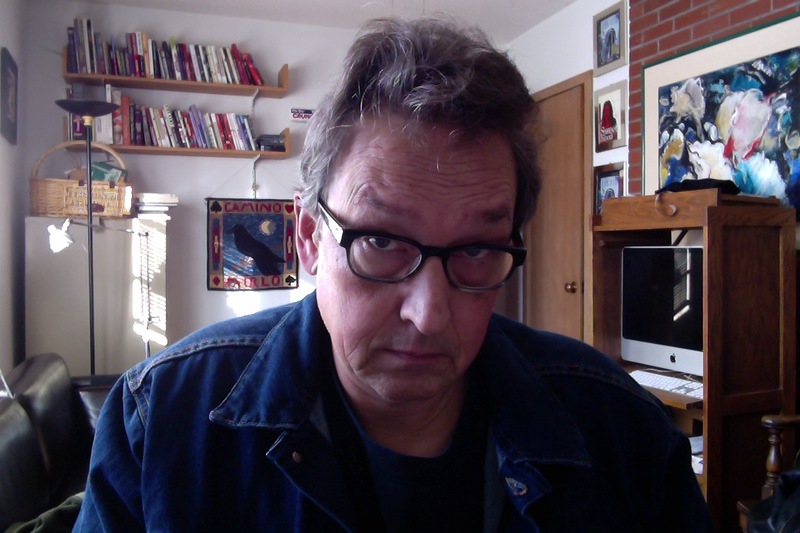 The author, captured while Skypeing in his natural environment. Because Skyping doesn’t involve travel, I can be quite flexible in scheduling Skype visits—I have done visits with only a one or two day notice. Of course, the more lead time you give yourself the better. I suggest reserving a time two or three months in advance, if possible. To set up a visit contact me directly. My fee for a single Skype session of up to 60 minutes is $200. 1. Have the camera as close to the display as possible, so that the students are looking toward the camera when they're looking toward my on-screen image. 2. Ask your students to prepare questions ahead of time. My Skype sessions are almost entirely Q&A, because Skype is an interactive medium, not a video. I suggest vetting the questions if you have time, to avoid repeats. 4. Because Skype sound quality varies, and because students often get nervous and do not speak clearly, and because I went to a lot of rock concerts back in the 70s and 80s, please be prepared to step in and repeat or rephrase a student's question if I seem to having trouble hearing. 5. Unless you do a lot of Skypes and never have any problems, I suggest doing a test call 24 to 48 hours before the scheduled event. Skyping tech problems are always minor and solvable within a matter of minutes, but those minutes are far less stressful when you don’t have a roomful of squirming 8th graders. 6. Before the event, it will helpful for me to know how many students I’ll be talking with, their grade level, and which of my books they have read.